Located by the banks of the picturesque Dal Lake, this shrine has a rich and interesting history. 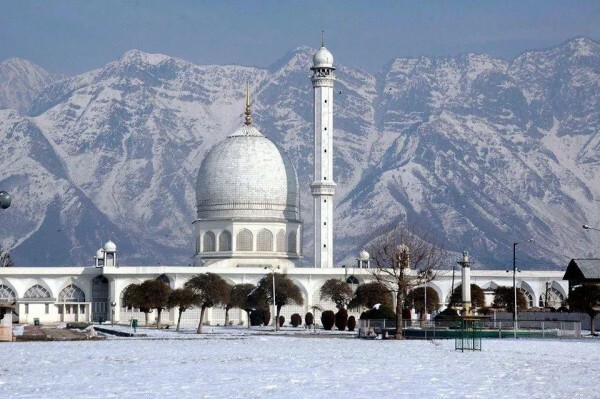 The Hazratbal Shrine dates back to the 17th century, when a subhedaar of Shah Jahan, Sadiq Khan, commissioned a garden on the bank of the Dal Lake and built a royal building by the name of Ishrat Mahal. It was later turned into a prayer house and today, attracts visitors not only for its religious importance but also for its beauty and grace. If you plan to visit Srinagar this summer, you can take advantage of Travelguru’s summer hotel sale and avail of flat 40% off on hotels in Srinagar. The Hazratbal Shrine flaunts a Mughal and Kashmiri style of architecture, which makes this shrine truly gorgeous and captivating. Add to it the backdrop of the mighty Himalayas, sometimes snow-capped, the shrine will leave the most articulate person speechless. Built completely of white marble, this shrine is also a major tourist attraction in Srinagar. Surrounded by lush greenery and an inviting ambience, the Hazratbal shrine is a must-visit if you are fascinated by Islamic culture, religion and architecture. Have you ever visited the Hazratbal Shrine? How was your experience? Plan a trip to Srinagar with Travelguru and make your Srinagar hotels booking by choosing one of the summer hotel deals on offer!